Good Enough To Eat: Kiss Air Candles - Fashion For Lunch. Looking for a new candle which is good enough to eat? I think these Kiss Air candles might be exactly what you need! Kiss Air candles come in a whole range of sweet treat scents; Almond Macaroon, Blueberry Cheesecake, Coconut, Chocolate Cake, Cinammon and Sun Kissed Raspberries to name a few. All super sweet and fun! 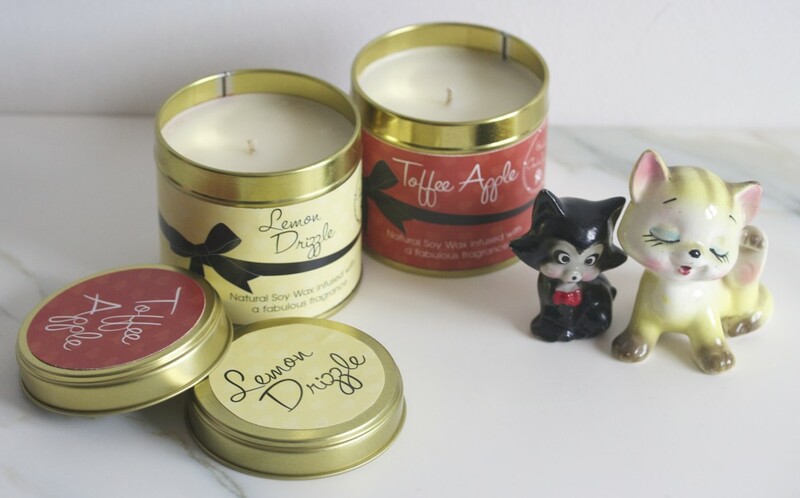 If you are hosting a cocktail party and want the room to match your drinks, then maybe you should consider trying a Kiss Air candle from their cocktail range. There are scents such as Strawberry Daiquiri, Peach Bellini, Pina Colada and Frozen Margarita. Ladies who love a cocktail will love this range! One of my favourite cakes is Lemon Drizzle so when I found out there was a candle in this scent, I couldn’t resist giving it a go! It smells like a sweet lemon dream and I love it! I normally go for more spa / aromatherapy scents, but this is so much fun, I can’t resist! I also picked the Toffee Apple Candle as it smells so sweet like caramel, it smells like there is a sticky toffee pudding baking in the oven. So yummy! The only thing is, it does make me want extra desert, but that’s a good thing right?! Kiss Air candles are a really affordable treat for yourself and a great little gift for a gal pal, oh and they are made of Soy wax, which is so much better than Paraffin wax candles!